This baby was giving me serious eyes. All photos by Mary Holland. 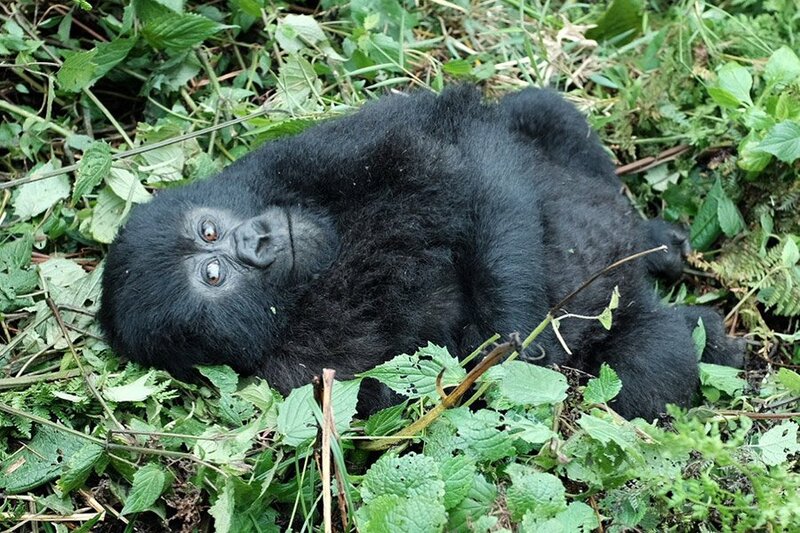 Travel writer and South African native Mary Holland just returned from a trip to Rwanda and Uganda, where the main thrill involved spotting cute baby gorillas in their natural habitat at Volcanoes National Park. We looked through her travel photos and picked a few favorites. RWANDA – I'm standing wedged between two bushes almost ankle-deep in dark, squelchy mud, when the tracker ahead of me comes to a sudden halt. He doesn't give any indication as to why we've stopped but I presume that, somewhere in the dense shrubbery ahead, he's spotted a mountain gorilla. We've been trekking for nearly an hour through the thick forests of Rwanda's Volcanoes National Park — scrambling over branches and hacking through bushes — in search of these rare mountain primates, so this moment is a highly anticipated one. The porter in front, who's been been helping me navigate the muddy terrain and dodge the stinging nettles, points to a mound of fur hidden in the bushes. The leaves shake, the mound moves, and the realization whacks me like a bush in the face: gorilla. The tracker motions for us to move forward and suddenly, a few feet away from us, gorillas are everywhere. There isn't a chance for the significance of the moment to sink in. I want to record everything, but I also don't want my experience to be from behind a lens, so I shift between photographing and staring at them, hypnotized by their presence. We spend an hour observing them in near silence, then take a forty-minute hike back through the forest, back to the border of the national park, where the impenetrable shrubbery meets farmland. This is where our experience began and where it will also end. It feels weird, almost dreamlike, and I'm still waiting for the magnitude of it to register. Did that just happen? Yes, it did. And here's the proof. 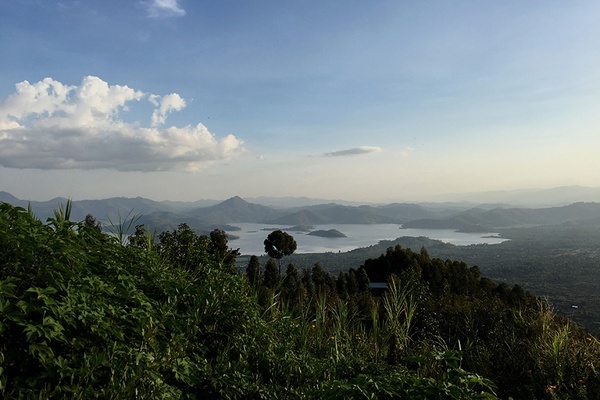 Rwanda, the lush African country that — despite a terribly troubling past — is emerging as one of the continent's most sought-after destinations. From this image of the Virunga Volcanoes and the twin lakes (taken from Virunga Lodge), it's easy to see why. 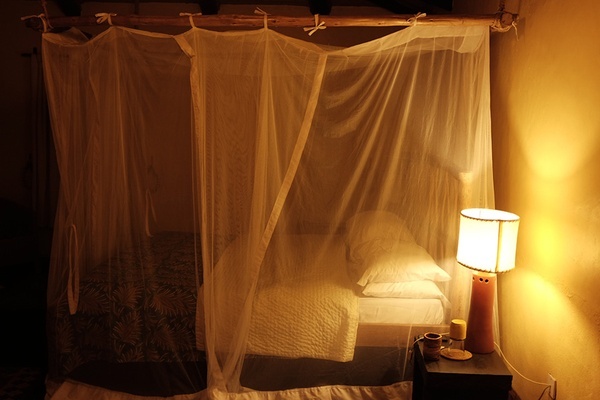 An early morning shot from my cozy cocoon at Volcanoes Safari's' in the northern part of the country. I took this photo before my trek through Volcanoes National Park in search of the gorillas. 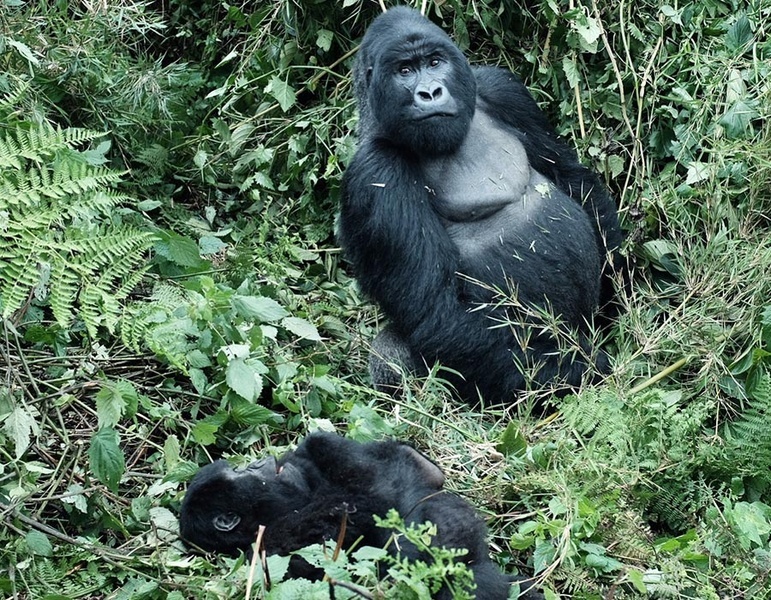 There are only three countries in the world where these great mountain gorillas exist (Rwanda, Uganda, and the Demoratic Republic of the Congo). Once bordering on extinction, there are now more gorillas in the wild than there were 50 years ago (they still require immense protection). It's a hefty fee ($1,500) for a gorilla permit, but it allows the opportunity to spend one hour with a semi-habituated group of gorillas living deep in the forests. Seeing a gorilla in the wild is a visceral experience. This is one of the males in the Sabinyo family, a group of gorillas living in the Volcanoes National Park. After trekking through the bushes for roughly forty minutes (hacking through branches, sloshing through mud, tearing away stinging nettles), we stumbled upon the group, which the trackers had located for us. 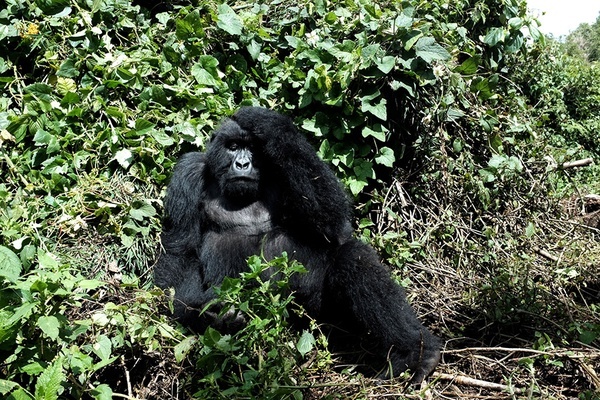 The trackers work closely with guides to provide intel on the gorillas' whereabouts. It's important that they're carefully monitored; one foul sweep of disease can wipe an entire family out. Only eight tourists are allowed to visit a group of gorillas at a time, and they can only remain with them for one hour. Strict rules make this a successful wildlife program, which aids the country's commitment to sustainable tourism. 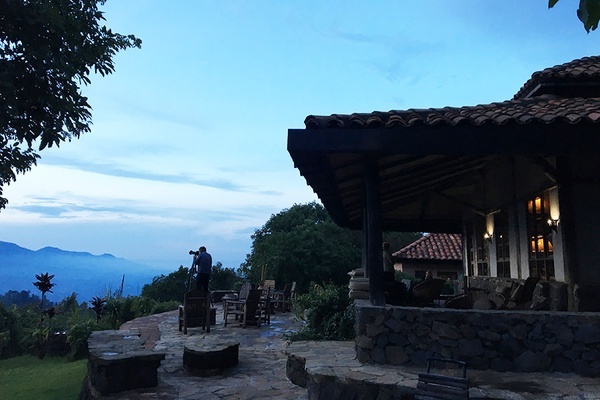 Back at Volcanoes Safaris' Virunga Lodge, the terrace was ideal for sipping on G&Ts while watching the sunset and letting the events of the day sink in. From Rwanda, we hopped over the border to Uganda. 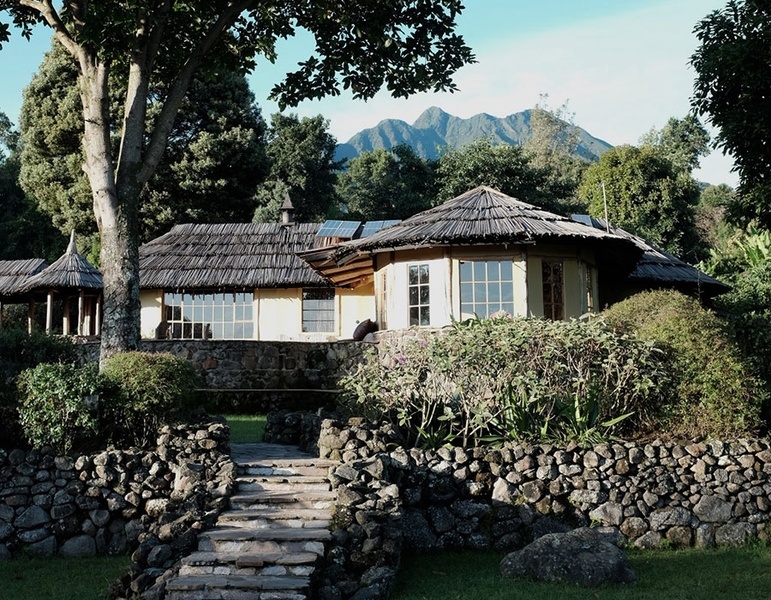 This is Volcanoes Safari's , a low-key accommodation which allows access to a lush part of rural Uganda at the foothills of Virunga Volcanoes. There's little access to WiFi, and in the rainy season, the hot water is ropey and the rooms are warmed with fires (the beds come with hot water bottles! ), which all adds to its charm. 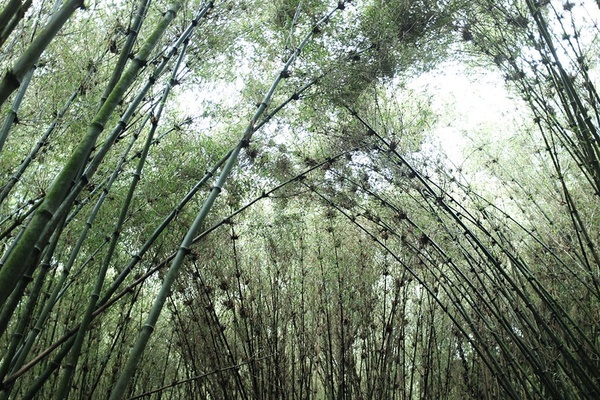 A painfully pretty canopied bamboo forest hidden in Mgahinga National Park, where visitors go in search of gorillas and golden monkeys. 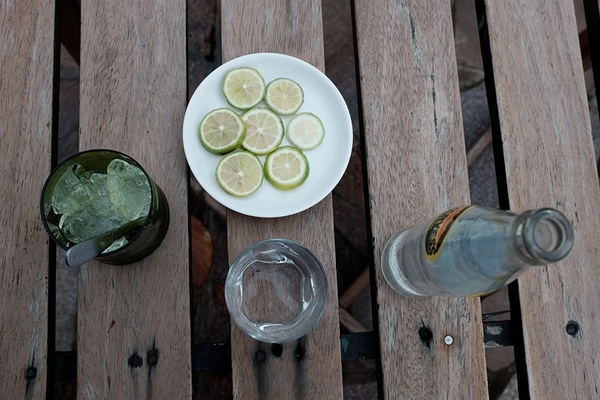 All the components of a perfect gin and tonic. After getting caught in a rainstorm in Mgahinga National Park while searching for the golden monkeys (which were hiding high up in the trees), this afternoon beverage couldn't come sooner. Also, wasn't tonic water used as a prophylactic against malaria once upon a time? 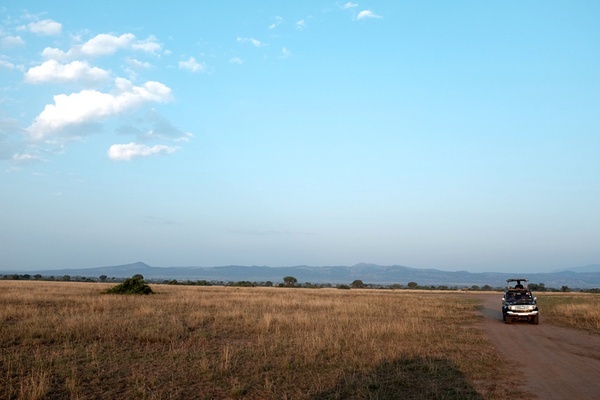 Further north of Mgahinga National Park is Queen Elizabeth National Park, where a more traditional safari is possible. You won't find gorillas here, but you will find tree-climbing lions. Although I didn't get to see one myself this time around, I did find antelopes, hippos, and elephants. 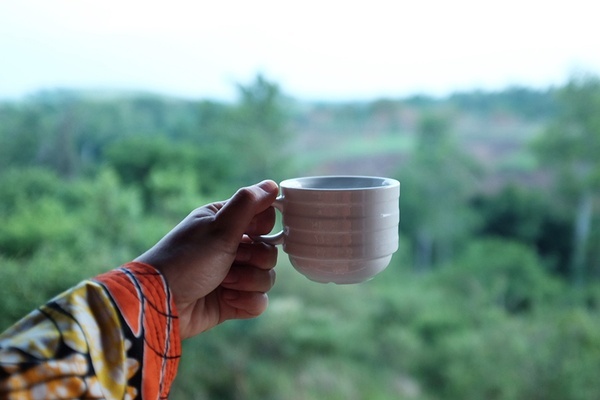 My morning cup of coffee at Volcanoes Safari's on the edge of Queen Elizabeth National Park. The coffee is made by a female-run cooperative, where a group of HIV-positive or HIV-affected women grow, roast, and grind organic coffee (all by hand). It's currently only sold locally, but with more recognition and funding from foreigners, the brand will have the chance to grow. 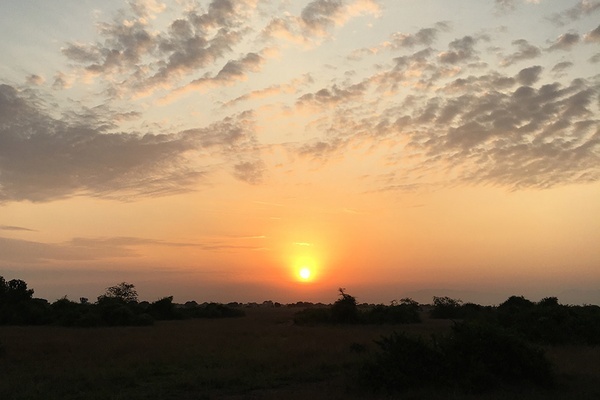 Sunrise over Queen Elizabeth National Park. This is Africa's magic hour. I'll leave you with one more image of Rwanda's great mountain gorillas. I like to call this one: The Thinker. У нашей организации важный веб сайт , он описывает в статьях про www.steroid-pharm.com.